A new month is almost upon us, and as such we have a plethora of new toy images to look at. Kicking us off is the June releases for Kaitou Sentai LupinRanger VS PatRanger featuring the exciting new Ranger on the block: Patren X and Lupin X! In this round, Bandai has released photos for the following products: DX X Changer, the DX X Rod Sword, and of course sofubi vinyls of both Patren X and Lupin X to go alongside the latest magazine scans that were just released a few days ago. Are you looking forward to the debut of this new Ranger or his toys? Make the jump and let us know what you think the discussion thread! 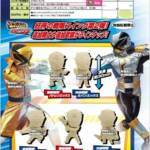 New LupinRanger VS PatRanger Scans Online- Ranger X Joins The Fight! 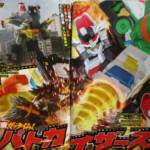 Another round of magazine scans has begun circling the Internet, giving fans a few tidbits about the further adventures of Kaitou Sentai LupinRanger vs Keisatsu Sentai PatRanger! 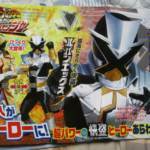 This month’s star is the mysterious Ranger X! This newcomer is able to shift between forms- the silver Lupin X and the gold Patren X. However, the new Rangers’ true identity has not yet been revealed at this time- fans can only wonder who is behind the helmet. X is not allied with the LupinRangers OR the PatRangers but does fight the Gangler whenever they appear- he will help whichever team he feels needs it. To activate his powers, X uses his unique henshin device- the X-Changer! 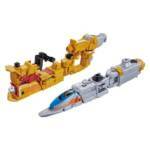 This new Changer comes with a pair of special VS Vehicles based on trains- the X-Train Gold & X-Train Silver. 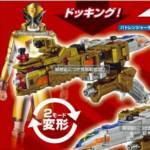 To change forms, Ranger X merely rotates the cannon on the Changer. Rounding out his arsenal, X has a signature weapon- the X Rod Sword which also has two unique modes- Sword Mode and Jitte Mode. Finally, some interesting casting has been announced for the upcoming LupinRanger VS PatRanger summer movie: Comedian Naoki Tanaka will be playing the role of Herlock Sholmes– the only detective to ever catch legendary thief Arsene Lupin! 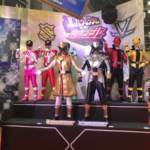 Definitely some exciting times ahead for Super Sentai fans! Stay tune to TokuNation as we keep you up to date on all Super Sentai reveals. First Lupin-X & Patren-X Costume Images Posted Online! Thanks to some new catalog images, we have our first look at the physical suits for the upcoming new member(s) of Kaitou Sentai Lupin Ranger VS Keisatsu Sentai Patranger! This new entity appears to be a “double-agent,” working with BOTH Ranger teams! 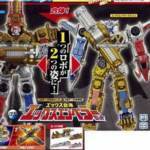 The silver form is known as Lupin-X while the gold form is called Patren-X. Forms are changed using a new device called the X-Changer. Sadly, the full story of this new Ranger remains unrevealed at time of writing. Stay tuned to TokuNation as we keep you up to date on this unique new Super Sentai series! We’ve just seen the first look at the double agent Lupin-X and Patren-X and now we have our first look at his mecha – the X-Emperor! We also get a look at some new VS Mecha that will be joining the team. We have a construction crane that doubles as an arm; a stealth bomber that doubles as a shield; as well as the two core mecha that form the body for X-Emperor’s two forms – one for Lupinranger and one for Patranger. Click the title of the story for the images. Thanks to @TheRealMattHunt and @SpecialForm12 for sharing the images. Thanks to magazine scans originating from 4chan we have our first look at the fourth – or is it the seventh? – Ranger to join the Lupinranger vs Patranger series. Seemingly a double agent, the newest member has two names – Lupin-X (Silver) and Patren-X (Gold) – depending on which team he’s fighting with. Using his morpher the X-Changer the X-Train Fire allows him to morph in to Patren-X while the X-Train Thunder allows him to morph in to Lupin-X. He can also summon the X-Emperor mecha when things get a little too big to handle. Big thanks to @Evilspacewhale for the initial heads up and @SpecialForm12 for the translations. Are you excited yet? Sound off in the discussion thread!